The development of atherosclerosis, a chronic inflammatory disease characterized by the formation of arterial fibrotic plaques, has been shown to be reduced by IL-33 in vivo. However, whether IL-33 can directly affect macrophage foam cell formation, a key feature of atherosclerotic plaques, has not been determined. In this study, we investigated whether IL-33 reduces macrophage foam cell accumulation in vivo and if IL-33 reduces their formation in vitro using THP-1 and primary human monocyte-derived macrophages. In Apolipoprotein E−/− mice fed on a high fat diet, IL-33 treatment significantly reduced the accumulation of macrophage-derived foam cells in atherosclerotic plaques. IL-33 also reduced macrophage foam cell formation in vitro by decreasing acetylated and oxidized low-density lipoprotein uptake, reducing intracellular total and esterified cholesterol content and enhancing cholesterol efflux. These changes were associated with IL-33–mediated reduction in the expression of genes involved in modified low-density lipoprotein uptake, such as CD36, and simultaneous increase in genes involved in cholesterol efflux, including Apolipoprotein E, thereby providing a mechanism for such an action for this cytokine. IL-33 also decreased the expression of key genes implicated in cholesterol esterification and triglyceride storage, including Acyl-CoA:cholesterol acyltransferase 1 and Adipocyte differentiation-related protein. Furthermore, using bone marrow-derived macrophages from ST2−/− mice, we demonstrate that the IL-33 receptor, ST2, is integral to the action of IL-33 on macrophage foam cell formation. In conclusion, IL-33 has a protective role in atherosclerosis by reducing macrophage foam cell formation suggesting that IL-33 maybe a potential therapeutic agent against atherosclerosis. A recently discovered member of the IL-1 cytokine family is IL-33 (IL-33, IL-1F11), which signals through ST2, the IL-1–receptor superfamily member (1). The ST2 gene encodes two full length protein isoforms: the membrane-bound ST2L and a soluble form, sST2, which acts as a decoy receptor for IL-33. IL-33 induces the production of the Th2 cytokines, IL-4 and IL-13, and enhances serum Ig synthesis (1). Consistent with these observations, IL-33 is a promoter of Th2-dependent inflammatory diseases (2, 3). IL-33 activates a number of cell types, including Th2 cells, mast cells and basophils (reviewed in Refs. 2, 3), and mediates anaphylactic shock (4) and promotes systemic sclerosis (5). Conversely, IL-33 has been found to be cardioprotective through ST2 (6) and can inhibit the development of atherosclerosis in vivo by inducing a phenotypical Th1-to-Th2 switch and by stimulating the production of IL-5 and oxidized low-density lipoprotein (OxLDL)-specific Abs (7). The IL-33 decoy receptor, sST2, reversed the atheroprotective actions of IL-33 and even exacerbated the disease in vivo (7) and sST2 serum levels were markedly increased after myocardial infarction (8). Atherosclerosis is a progressive, Th1-driven chronic inflammatory disease of the vasculature characterized by the formation of fibrotic plaques in the major arteries (9, 10). The chronic inflammation characteristic of atherosclerosis is believed to be due to the persistent recruitment of immune cells, including monocytes and CD4+ Th1 T lymphocytes, to atherosclerotic lesions. Macrophages, which differentiate from infiltrating monocytes in response to endothelial cell released M-CSF, are capable of ingesting modified forms of LDL, such as OxLDL, which accumulate in the subendothelial compartment to form cholesterol-loaded foam cells (9–11). Macrophage-derived foam cells form the foundation of atherosclerotic plaques (9, 10) and their formation is sensitive to cytokines, like IFN-γ (11). In this report, we demonstrate for the first time that IL-33 markedly reduces foam cell accumulation in the atherosclerotic plaques of Apolipoprotein E (ApoE)−/− mice. In addition, we show that IL-33 significantly reduces macrophage foam cell formation in vitro in THP-1 macrophages and primary human monocyte-derived macrophages (HMDMs) by decreasing acetylated and oxidized LDL uptake, reducing intracellular total and esterified cholesterol content and by enhancing cholesterol efflux. Furthermore, we delineate a potential mechanism for the action of IL-33 involving decreased expression of key genes involved in modified LDL uptake, cholesterol esterification and triglyceride storage and simultaneously increased expression of those involved in the trafficking and efflux of cholesterol. Finally, using bone-marrow derived macrophages (BMMs) from ST2−/− mice, we demonstrate that the IL-33 receptor, ST2, is integral to the action of IL-33 on macrophage foam cell formation. Human THP-1 and mouse BMM cell cultures were maintained in complete RPMI 1640 or DMEM medium, respectively, supplemented with 10% (v/v) heat-inactivated FCS, penicillin (100 U/ml), streptomycin (100 μg/ml), and l-glutamine (2 mmol/L) (all Invitrogen, Paisley, U.K.), at 37°C in a humidified atmosphere containing 5% (v/v) CO2. HMDMs were isolated from buffy coats supplied by the Welsh Blood service using Ficoll-Hypaque purification. Briefly, blood from the buffy coat was layered over Lymphoprep (Nycomed Pharmaceuticals, Oslo, Norway) in Accuspin tubes (Sigma-Aldrich, Poole, U.K.) and centrifuged at 800 × g for 30 min. The resultant mononuclear cell interface was collected and washed six to eight times in PBS containing 0.4% (v/v) trisodium citrate to remove platelets. Monocytes were allowed to adhere to tissue culture plates in complete RPMI 1640 medium containing 5% (v/v) FCS for 7 d to enable macrophage differentiation and permit removal of nonadherent lymphocytes. Recombinant human and murine IL-33 was from Peprotech (London, U.K.) and R&D Systems (Abingdon, U.K.), respectively. PMA was from Sigma-Aldrich. THP-1 cells were differentiated into macrophages using 160 nM PMA for 24 h. Cytokines were made up in PBS (murine IL-33) or PBS/0.1% BSA (human IL-33). PBS/0.1% BSA was used as a vehicle control for in vitro human IL-33 stimulations. ST2−/− mice, on a BALB/c background, were generated as previously described (12) BMMs were isolated from 7- to 8-wk-old female ST2 wild-type (WT) and ST2−/− mice as previously described (13). Male ApoE−/− mice on the C57BL/6 background (backcrossed 10×, Charles River, U.K.) were bred inhouse in a pathogen-free facility, weaned at 6 wk old and fed an atherogenic diet ad libitum (0.15% cholesterol and 21% lard, Special Diet Services, Essex, U.K.). At 12 wk mice were randomly grouped and injected i.p. twice per week for 6 wk with PBS (as control) or murine IL-33 (1 μg/injection). ApoE−/− mice were euthanized at 18 wk of age prior to analysis. All mice were maintained at the Joint Animal Facilities, University of Glasgow, Glasgow, U.K., and all experiments were conducted in accordance to the animal guidelines of the Home Office, United Kingdom, under the Home Office Project License 60/3605. Cells were incubated for 24 h unless otherwise stated with 1,1′-dioctadecyl-3,3,3′,3′-tetramethylindocarbocyane perchlorate (DiI)-labeled acetylated LDL (DiI-AcLDL) or oxidized LDL (DiI-OxLDL) (10 μg/ml; both Intracel, Frederick, MD) in RPMI 1640 or DMEM (mouse BMMs) containing 0.2% (v/v) fatty-acid free BSA (Sigma-Aldrich) at 37°C. DiI-AcLDL or DiI-OxLDL uptake was analyzed by flow cytometry on a FACSCanto (BD Biosciences, Oxford, U.K.) flow cytometer with at least 10,000 events acquired for each sample. DiI-AcLDL or DiI-OxLDL uptake is represented as a percentage with the untreated control indicated as 100%. Macrophages (THP-1, HMDMs, and mouse BMMs) were converted into foam cells by incubation with AcLDL (50 μg/ml; Intracel) in media containing 0.2% (v/v) fatty-acid free BSA and [4-14C]cholesterol (0.5 μCi/ml; Amersham, Buckinghamshire, U.K.) for 24 h. Foam cell formation was confirmed by Oil Red O staining (data not shown). Subsequently, cells were treated for 24 h in media containing 0.2% (v/v) fatty acid-free BSA and Apolipoprotein A-I (ApoA-I) (10 μg/ml; Sigma-Aldrich). After this, the media was collected and the remaining cells were solubilized in 0.2 M NaOH. Cholesterol efflux was calculated as the percentage of [14C] counts in the medium versus total (cells and medium) as measured by a liquid scintillation counter. Fold change in cholesterol efflux was the fold difference in efflux between control and treated samples. Total RNA was prepared using the RNeasy Plus Mini kit (Qiagen, Crawley, U.K.) and was reverse transcribed into cDNA using M-MLV reverse transcriptase (Promega, Southampton, U.K.) and random hexamer primers. Real-time quantitative PCR analysis was performed using SYBR Green JumpStart Taq ReadyMix (Sigma-Aldrich) and primers, detailed in Supplemental Table 1, specific for human scavenger receptor A (SR-A), CD36, SR-BI, ApoE, ATP-binding cassette transporter A-1 (ABCA-1), ATP-binding cassette transporter G-1 (ABCG-1), Niemann Pick type C (NPC)-1, NPC-2, carnitine palmitoyltransferase-1 (CPT-1), adipocyte differentiation-related protein (ADRP), Acyl-CoA:cholesterol acyltransferase-1 (ACAT-1), neutral cholesteryl ester hydrolase (NCEH) and mouse SR-A, CD36, SR-BI, ApoE, ABCA-1, and ABCG-1. Quantitative PCR was performed using the DNA Engine Opticon 2 real-time PCR detection system (MJ Research, Cambridge, MA) and transcript levels were determined using the comparative Ct method and normalized to GAPDH (human) and β-actin (mouse) transcript levels. Human GAPDH and mouse β-actin were used as normalizing genes because they displayed stable expression levels in all samples. All PCRs were performed in duplicate and cDNAs, cloned into pGEM-T vector, were used as standards for quantitation and to verify specificity by DNA sequencing. Total cell lysates (THP-1 cells and HMDMs) were size-fractionated on NuPAGE 4–12% SDS-polyacrylamide gels (Invitrogen) and then analyzed by Western blotting using a previously described method (14). Abs against CD36 (sc-9154), SR-A (sc-20660), SR-B1 (sc-32342), and ABCG-1 (sc-11150) were from Santa Cruz Biotechnology (Santa Cruz, CA). Abs to ApoE (0650-1904) and ABCA-1 (NB400-105) were from Biogenesis (Poole, U.K.), and Novus Biologicals (Cambridge, U.K.), respectively. The Ab to β-actin was from Sigma-Aldrich. Semiquantitative measurement of Western blots was performed by densitometric analysis using the Gene Tools software (GRI, Braintree, U.K.). Macrophage (THP-1, HMDMs, and mouse BMMs) total and esterified cholesterol content was quantified using the Amplex Red Cholesterol Assay Kit (Molecular Probes, Eugene, OR), according to an adaptation of a previously described method (15). Macrophages were fixed in 2% (v/v) paraformaldehyde for 15 min, washed three times with PBS before incubation with 200 μl 3:2 (v/v) hexane:isopropanol for 30 min at 4°C to extract cellular lipids. Total cholesterol and cholesterol ester content was determined by incubating 50 μl extracted lipids, diluted in 1× Reaction buffer supplied with the kit, with 50 μl Amplex Red Assay reagent containing cholesterol esterase (total cholesterol) or with 50 μl Amplex Red Assay reagent lacking cholesterol esterase (free cholesterol) for 30 min at 37°C in the dark and then measuring fluorescence (BMG Labtech [Aylesbury, U.K.] FLUOstar Optima microplate reader; 535 nm excitation, 595 nm emission). Total and free cholesterol content of each sample was calculated using a cholesterol standard curve. Cholesterol ester content was calculated by subtracting levels of free cholesterol from levels of total cholesterol for each sample. Lipid-extracted macrophages were incubated with 0.1% (weight/volume ratio [w/v]) SDS/0.2 M NaOH for 30 min at room temperature to extract cellular protein. Total cellular protein levels were determined using the Pierce BCA assay (Pierce, Cramlington, U.K.). Total cholesterol and cholesteryl ester levels were represented as nanogram of total cholesterol or cholesteryl ester per microgram of protein. Quantification of macrophage-derived foam cell content in vivo was performed using F4/80 staining of atherosclerotic plaques with an adaptation of a method described previously (16). Briefly, each heart from ApoE−/− mice was sectioned parallel to the atria and sections fixed, processed and embedded in paraffin wax. Five 7-μm sections starting from the three valve cusps of the aortic sinus at 35-μm intervals were cut and stained with anti-F4/80 (clone CI:A3-1, Serotec, Kidlington, U.K.) for macrophages. Staining was visualized as previously described (7). The mean number of foam cells (F4/80+ macrophages that contained intracellular lipid droplets) were counted per millimeter squared of plaque in five sections from each mouse (from each group, n = 8–9 mice) using Scion Image software (Scion, Frederick, MD). All data are mean ± SD with n indicating the number of independent experiments. Statistical analysis was performed using Student t test. We first investigated the effect of IL-33 on the accumulation of macrophage-derived foam cells into atherosclerotic plaques in vivo. To do this, we analyzed the same sections that were used to identify that IL-33–reduced macrophage accumulation in aortic sinus plaques of ApoE−/− mice (7) to ascertain whether IL-33 altered the number of foamy macrophages (F4/80+ macrophages containing lipid droplets). Fig. 1 shows that, in these sections, IL-33 treatment significantly reduced the number of lesion-associated, F4/80+ macrophage foam cells by 74% (6116 ± 1711 versus 1634 ± 316 cells/mm2, p < 0.001). These results demonstrate that not only does IL-33 reduce the percentage of macrophages residing in atherosclerotic plaques in mice as described previously (7), it can effectively reduce the number of macrophages that have been converted into foam cells. To investigate the mechanism by which IL-33 reduces macrophage foam cell formation and potential clinical relevance, we studied the effect of IL-33 on human macrophage cells as detailed below. IL-33 reduces foam cell accumulation in ApoE−/− mice in vivo. Male ApoE−/− mice were treated with PBS (open bars) or IL-33 (filled bars). A, Representative photomicrographs of F4/80+ macrophages (brown, original magnification ×40) staining in plaques of ApoE−/− mice treated with PBS or IL-33 (n = 8–9 mice). B, Quantification (cells/mm2) of the number of plaque foam cells (F4/80+ macrophages with intracellular lipid droplets, n = 8–9 mice). Data represents mean plaque foam cell content ± SD. ***p < 0.001 by Student t test. An imbalance in the uptake of modified LDL and the efflux of cholesterol by macrophages is known to drive their formation into foam cells (9–11). Proatherogenic cytokines, such as IFN-γ, promote macrophage foam cell formation by enhancing modified LDL uptake, and ablating cholesterol efflux (11). To investigate the role of IL-33 in modified LDL uptake and cholesterol efflux, we first measured the impact of exogenous IL-33 stimulation on the uptake of AcLDL [a type of LDL extensively used in the in vitro foam cell formation assays (17–19)] and OxLDL [a key form of modified LDL found in atherosclerotic plaques (9, 10, 17, 18)] and on the efflux of [14C]cholesterol by both 24 h PMA-differentiated THP-1 macrophages and 7 d differentiated HMDMs. PMA-differentiation of THP-1 macrophages for 24 h was used to ensure high expression levels of scavenger receptors (20). ST2L expression was confirmed on both THP-1 macrophages and HMDMs (Supplemental Fig. 1). DiI-AcLDL and DiI-OxLDL uptake and [14C]cholesterol efflux by both THP-1 macrophages and HMDMs was assayed after 24 h stimulation with or without IL-33. Using a range of concentrations (1–20 ng/ml) and length of stimulation period (1–24 h), it was found that IL-33 produced a significant decrease in DiI-AcLDL uptake by THP-1 macrophages with the greatest response observed at 24 h by 10 ng/ml (∼15% reduction; Supplemental Fig. 2). This concentration lies within the physiological range of human serum IL-33 levels because they can reach up to 40 ng/ml depending on health status (4) and has also been widely used by other in vitro studies (1, 6, 21). This concentration and length of stimulation were used subsequently for all future experiments. 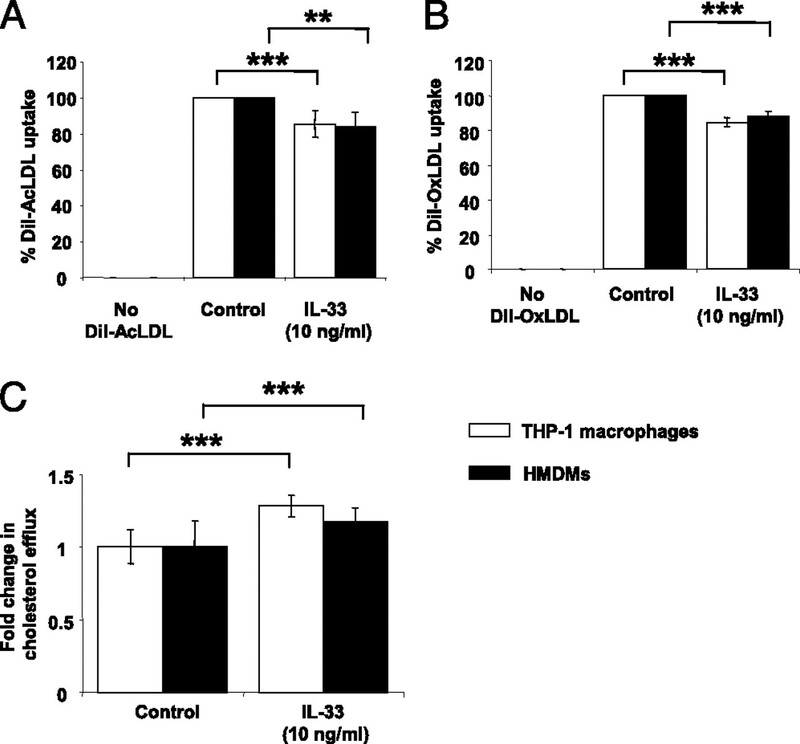 IL-33 also induced a significant decrease in DiI-AcLDL uptake by HMDMs and in DiI-OxLDL uptake by both THP-1 macrophages and HMDMs compared with the untreated control (Fig. 2A, 2B). The reduction in DiI-AcLDL and DiI-OxLDL uptake observed contrasts that seen with the proatherogenic cytokine IFN-γ that is known to increase AcLDL and OxLDL uptake and promote foam cell formation (11, 22). Furthermore, IL-33 markedly increased cholesterol efflux from both THP-1 macrophages and HMDMs compared with the untreated control (Fig. 2C). This change in cholesterol efflux is again the opposite of that seen with IFN-γ that is known to decrease cholesterol efflux from macrophages (23) and is similar to that seen with the antiatherogenic cytokine TGF-β (24). IL-33 decreases the uptake of AcLDL and OxLDL and enhances cholesterol efflux by THP-1 macrophages and HMDMs. DiI-AcLDL (A) and DiI-OxLDL (B) uptake were measured in 24 h 160 nM PMA-differentiated THP-1 macrophages (open bars) or 7 d differentiated HMDMs (filled bars) incubated for 24 h in the presence or absence of IL-33 (10 ng/ml (n = 4). C, Cholesterol efflux was assayed in foam cells from 24 h PMA-differentiated THP-1 macrophages or 7 d differentiated HMDMs incubated for 24 h in the presence or absence of IL-33 (10 ng/ml) (n = 6). Data represents mean ± SD. **p < 0.01; ***p < 0.001 by Student t test. The uptake of AcLDL and OxLDL into macrophages principally involves a family of SRs, including SR-A, SR-B1, and CD36, which are known to bind and internalize both forms of LDL (11, 25). Members of the ABC transporter family, such as ABCA-1 and ABCG-1, are involved in directing cholesterol efflux from macrophages by active, reverse cholesterol transport in a process that requires the presence of lipid-free, cholesterol acceptors like ApoE and ApoA-I (9–11). We therefore next investigated whether IL-33 can change the expression of these key genes. IL-33 significantly reduced the mRNA expression of SR-A, CD36, and SR-B1 in both THP-1 macrophages and HMDMs (Fig. 3A). In contrast, IL-33 elevated the mRNA expression of ApoE, ABCA-1, and ABCG-1 in THP-1 macrophages and HMDMs (Fig. 3B). The IL-33–stimulated increases in ApoE, ABCA-1, and ABCG-1 mRNA expression were also similarly seen in AcLDL-converted foam cells (data not shown). The IL-33–induced changes in mRNA expression were confirmed by Western blot analysis that showed that IL-33 reduced the expression of all three scavenger receptor proteins and increased the expression of ApoE, ABCA-1, and ABCG-1 proteins (Fig. 4). Collectively, these data suggest that IL-33 decreases AcLDL/OxLDL uptake and enhances cholesterol efflux by altering the mRNA and protein expression of key genes implicated in the uptake and efflux of cholesterol. IL-33 regulates the expression of key genes implicated in the uptake and efflux of cholesterol in THP-1 macrophages and HMDMs. Real-time quantitative PCR for SR-A, CD36, SR-BI (A), ApoE, ABCA-1, and ABCG-1 (B) was performed on cDNA from 24 h PMA-differentiated THP-1 macrophages (open bars) or 7 d differentiated HMDMs (filled bars) incubated for 24 h in the presence or absence of IL-33 (10 ng/ml) (n = 5). mRNA expression levels were calculated using comparative Ct method and normalized to GAPDH levels with untreated cells given an arbitrary value of 1. Data represents mean ± SD. *p < 0.05; **p < 0.01; ***p < 0.001 by Student t test. IL-33 regulates the expression of key proteins implicated in the uptake and efflux of cholesterol in THP-1 macrophages and HMDMs. Twenty-four–hour PMA-differentiated THP-1 macrophages or 7-d differentiated HMDMs were incubated for 24 h in the presence or absence of IL-33 (10 ng/ml) (n = 4). A, Equal levels of protein from total lysates were analyzed by Western blotting using Abs against CD36, SR-A, SR-B1, ApoE, ABCA-1, ABCG-1, and β-actin. Multiple immunoreactive polypeptides for SR-A, SR-BI, CD36, and ApoE represent different isoforms and/or posttranslationally modified products. B, Semiquantitative analysis of all Western blots was performed by densitometric analysis using the Gene Tools software (GRI) and normalized to β-actin levels. Open bars indicate data for 24-h PMA-differentiated THP-1 macrophages and filled bars indicate data for 7-d differentiated HMDMs. Data represent mean ± SD. *p < 0.05; **p < 0.01; ***p < 0.001 by Student t test. Lipid accumulation during macrophage foam cell formation not only involves an imbalance in the uptake of modified LDL and the efflux of cholesterol but also intracellular mechanisms that promote cytoplasmic storage of cholesteryl esters and triglyceride-rich lipid droplets (26). These mechanisms engage to increase the intracellular levels of total and esterified cholesterol in macrophages and, as such, provide an additional indicator of foam cell formation. We therefore next investigated whether IL-33 also affects intracellular total and esterified cholesterol levels in THP-1 macrophages and HMDMs. IL-33 significantly reduced the levels of total and esterified cholesterol in AcLDL-converted THP-1– and HMDM-derived foam cells (Fig. 5A, 5B). These results therefore further support the notion that IL-33 reduces macrophage foam cell formation. IL-33 reduces total and esterifed cholesterol content in human macrophages. Total cholesterol (A) and esterified (B) cholesterol levels were quantified in AcLDL-converted 24-h PMA-differentiated THP-1(open bars) and 7-d differentiated HMDM foam cells (filled bars) after incubation for 24 h in the presence or absence of IL-33 (10 ng/ml) (n = 4). C, Real-time quantitative PCR for NPC-1, NPC-2, CPT-1, ADRP, NCEH, and ACAT-1 was performed on cDNA from 24-h PMA-differentiated THP-1 macrophages (open bars) or 7-d differentiated HMDMs (filled bars) incubated for 24 h in the presence or absence of IL-33 (10 ng/ml) (n = 4). mRNA expression levels were calculated using comparative Ct method and normalized to GAPDH levels with untreated cells given an arbitrary value of 1. Data represent mean ± SD. *p < 0.05; **p < 0.01; ***p < 0.001 by Student t test. The cellular mechanisms involved in the cytoplasmic storage of cholesteryl esters and triglyceride-rich lipid droplets are regulated by a network of proteins, involved in intracellular cholesterol storage and transport, which themselves are cytokine sensitive (11, 22, 26–28). These include NPC-1, NPC-2, CPT-1, ADRP, ACAT-1, and NCEH. Both NPC-1 and NPC-2 control the trafficking of cholesterol from the late endosome/lysosome to the plasma membrane for cholesterol efflux (26). CPT-1 reduces fatty acid availability for cholesterol esterification and ADRP increases intracellular triglyceride storage (26). In addition, ACAT-1, associated with macrophage-derived foam cells in atherosclerotic plaques (11), esterifies cholesterol within the endoplasmic reticulum and NCEH regulates cholesteryl ester accumulation by controlling its hydroylsis (26). We therefore investigated whether IL-33 could affect the expression of NPC-1, NPC-2, CPT-1, ADRP, ACAT-1, and NCEH in THP-1 macrophages and HMDMs. 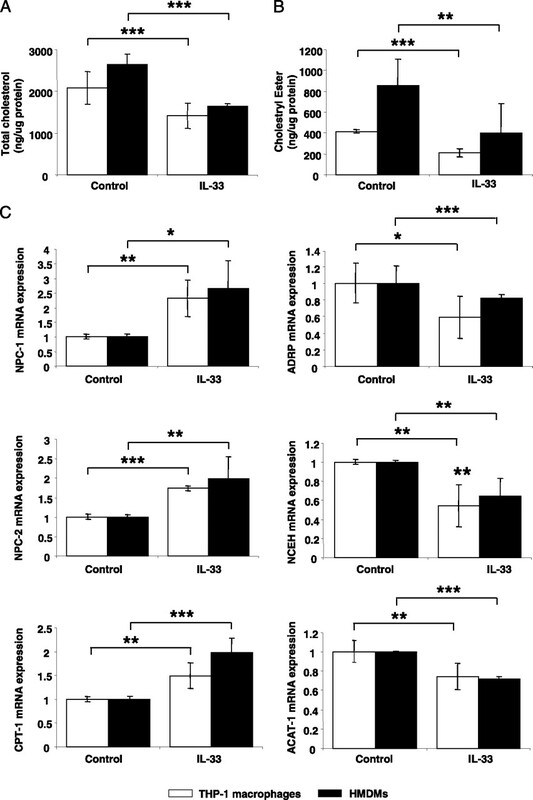 IL-33 significantly increased NPC-1 and NPC-2 mRNA expression (Fig. 5C). These results are consistent with the higher levels of cholesterol efflux and mRNA/protein expression of ApoE, ABCA-1 and ABCG-1 in these cells (Figs. 2–4). IL-33 also increased CPT-1 mRNA expression (Fig. 5C) suggesting that IL-33 contributes to less cholesterol esterification. Furthermore, IL-33 significantly decreased ADRP and ACAT-1 mRNA expression (Fig. 5C). The reduction in these two genes may contribute to less cholesteryl ester accumulation and triglyceride storage. IL-33 also significantly reduced NCEH mRNA expression although this observed effect is not consistent with IL-33–stimulated changes in cholesteryl ester levels (Fig. 5B) because over-expression of NCEH reduces cholesteryl esters in human macrophages (29). Collectively, these data indicate that IL-33 reduces the levels of total and esterified cholesterol content in human macrophages and that this phenotype involves the alteration in the expression of key genes associated with cholesterol storage and transport. To demonstrate the specificity of IL-33–induced lipid metabolism in macrophages, we compared DiI-OxLDL uptake, intracellular total and esterified cholesterol levels, and [14C]cholesterol efflux following exogenous IL-33 stimulation of BMMs isolated from WT and ST2−/− mice. IL-33 significantly decreased DiI-OxLDL uptake in WT BMMs and intracellular total and esterified cholesterol levels in AcLDL-converted WT BMM foam cells (Fig. 6A–C), mirroring that seen in human macrophages (Figs. 2, 5). In contrast, IL-33 was unable to induce this change in both DiI-OxLDL uptake in ST2−/− BMMs and intracellular total and esterified cholesterol levels in AcLDL-converted ST2−/− BMM foam cells. In addition, the level of DiI-OxLDL uptake in unstimulated ST2−/− BMMs was significantly higher than that in the WT BMMs, indicating that the IL-33 receptor may autoregulate OxLDL uptake. IL-33 also significantly enhanced cholesterol efflux in the WT BMMs but not in the ST2−/− BMMs (Fig. 6D). 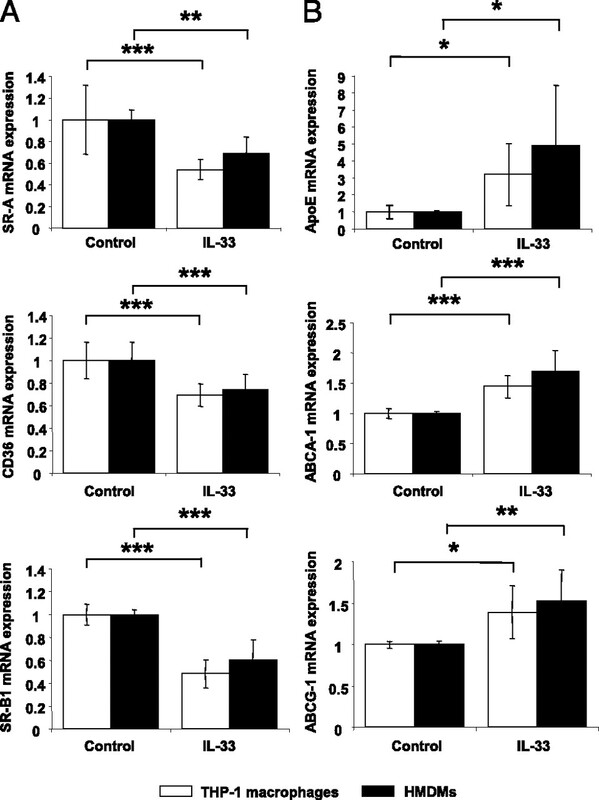 Furthermore IL-33 significantly reduced the mRNA expression of CD36, SR-A, and SR-B1 and enhanced the expression of ApoE and ABCA-1 in WT BMMs but not in ST2−/− BMMs (Fig. 6E). In addition, the levels of mouse CD36 expression were higher in unstimulated ST2−/− BMMs compared with WT BMMs. This could explain why the levels of DiI-OxLDL uptake were higher in unstimulated ST2−/− BMMs. These data further support the notion that IL-33 mediates a reduction in OxLDL uptake and an enhancement of cholesterol efflux in mouse BMMs by altering the expression of key genes implicated in the uptake of OxLDL and efflux of cholesterol in a ST2-dependent manner. ST2 is integral for the actions of IL-33 on macrophage foam cell formation. In vitro DiI-OxLDL uptake (A), total (B) and esterified cholesterol levels (C), cholesterol efflux (D), and mouse CD36, SR-A, SR-BI, ApoE, ABCA-1, and ABCG-1 mRNA expression (E) were measured in WT and ST2−/− BMMs after incubation for 24 h in the presence (filled bars) or absence (open bars) of mouse IL-33 (10 ng/ml) (n = 3–4). mRNA expression levels were calculated using comparative Ct method and normalized to mouse β-actin with WT BMMs given an arbitrary value of 1. Data represent mean ± SD. *p < 0.05; **p < 0.01; ***p < 0.001 by Student t test. The data reported in this study demonstrate for the first time that IL-33 plays an important role in reducing macrophage foam cell accumulation in atherosclerotic plaques in vivo and in decreasing macrophage foam cell formation in vitro in both human and murine macrophages. We also provide the molecular mechanism by which IL-33 reduces macrophage foam cell formation. IL-33 decreases both AcLDL/OxLDL uptake and intracellular total and esterifed cholesterol levels but enhances cholesterol efflux through regulation of key genes involved in modified LDL uptake, cholesterol efflux/transport, and the storage of cholesteryl esters and triglycerides. IL-6 and IL-10 have also been previously shown to inhibit macrophage foam cell formation (27, 28, 30, 31). IL-6 reduces AcLDL uptake by inhibiting SR gene expression (27), whereas IL-10 decreases foam cell formation by various mechanisms (28, 30, 31), some of which remain controversial (31). Our results demonstrate a clear cut mechanism by which IL-33 inhibits macrophage foam cell formation. The Th1 cytokine IFN-γ has been shown to promote macrophage foam cell formation (11, 22, 23, 32) but in addition it is able to regulate the formation of vascular smooth muscle cell (VSMC)-derived foam cells along with TNF-α (33, 34). IL-33 and ST2 are both expressed in the atherosclerotic vasculature on endothelial cells (7) and on VSMCs (1, 7). Therefore, VSMC foam cell formation could be regulated by IL-33 although it remains to be ascertained if IL-33 can also protect against atherosclerosis by inhibiting VSMC foam cell formation. IL-33 can localize to the nucleus and bind DNA through its N-terminal DNA-binding domain (2, 35) and mediate transcriptional repression (35). This function could explain the reduction in CD36, SR-A, and SR-B1 mRNA expression in human and murine macrophages by endogenously produced IL-33. In addition, exogenously added IL-33 mediates gene suppression in a ST2-dependent manner. IL-33/ST2 signaling can activate several downstream pathways leading to AP-1 and NF-κB activation (reviewed in Ref. 2) and therefore could regulate the expression of NPC-1, NPC-2, CPT-1, ADRP, ACAT-1, and NCEH genes. AP-1 and NF-κB binding sites exist in the ApoE and ABCA-1 promoters (36, 37), suggesting a potential mechanism of IL-33–mediated gene regulation through these signaling pathways. 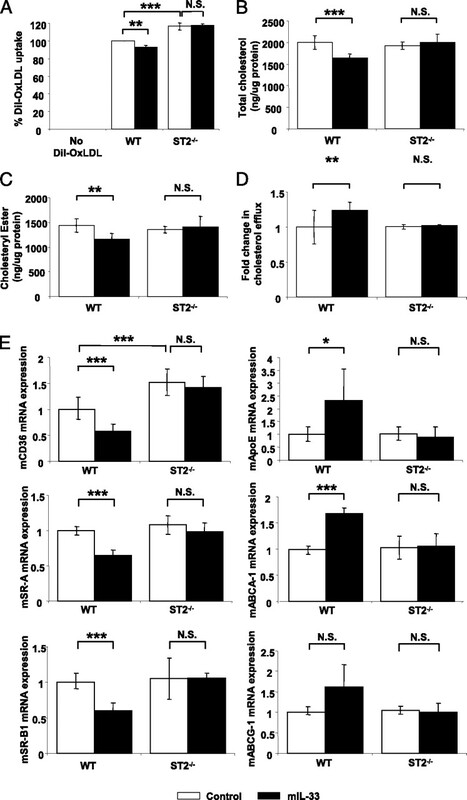 Analysis of OxLDL uptake by WT and ST2−/− BMMs identified a potential autoregulatory role for ST2 involving inhibition of CD36 expression. In the absence ST2, BMMs produced significantly higher levels of CD36 (Fig. 6E). The ability of cytokine receptors to modulate foam cell formation has been previously reported for the TNF superfamily receptor, TNFR1, which can decrease macrophage foam cell formation by reducing SR-A expression (38). A mechanism by which the autoregulatory role for ST2 is achieved could involve autocrine stimulation of ST2 by secreted IL-33. However, IL-33, which is expressed on monocytes, is not secreted by these cells unless they are damaged or necrotic (39), and in PMA-differentiated THP-1 macrophages, endogenous IL-33 remains cell associated (40). Alternatively, ST2 could function, in the absence of IL-33, as a negative regulator, akin to that reported earlier for IL-1 synthesis, whereby ST2 competitively binds to MyD88 and MAL (12). In conclusion, data presented in this study demonstrate that IL-33 is a potent inhibitor of macrophage foam cell formation in vivo and in vitro and provide an important, additional molecular mechanism by which IL-33 attenuates atherosclerosis. IL-33 blocks foam cell formation by directly regulating the expression of genes for AcLDL/OxLDL uptake, storage of cholesteryl esters and triglycerides and cholesterol efflux/transport, and by inducing a phenotypical Th1-to-Th2 switch. The potential clinical relevance of our observation is highlighted by the effect of IL-33 on primary human macrophages and suggests that IL-33 represents a promising therapeutic agent for controlling clinical atherosclerosis. This work was supported by British Heart Foundation Grant PG/07/031/22716 (to D.P.R) and by British Heart Foundation Intermediate Basic Science Research Fellowship FS/08/035/25309 (to A.M.M.).
. 2008. The IL-33/ST2 pathway: therapeutic target and novel biomarker. Nat. Rev. Drug Discov. 7: 827–840.
. 2010. 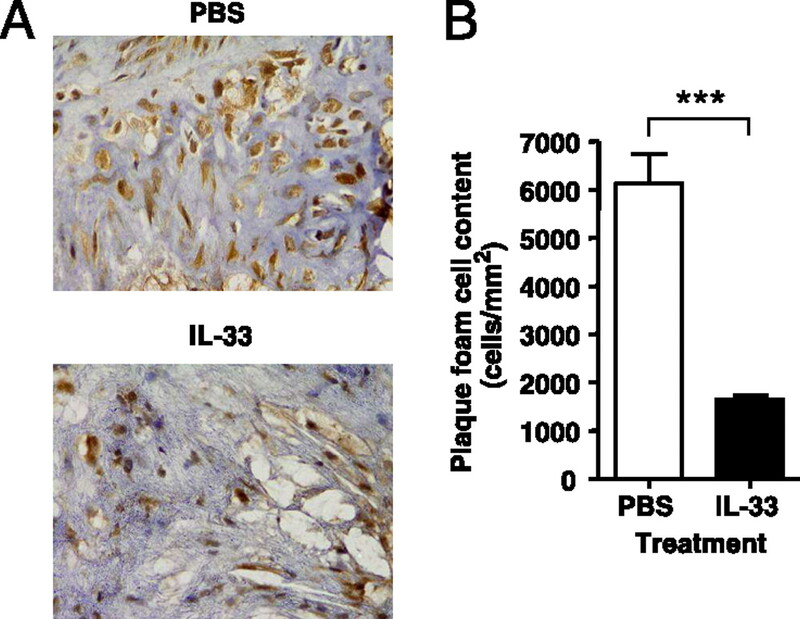 The IL1-like cytokine IL33 and its receptor ST2 are abnormally expressed in the affected skin and visceral organs of patients with systemic sclerosis. Ann. Rheum. Dis. 69: 598–605.
. 2007. IL-33 and ST2 comprise a critical biomechanically induced and cardioprotective signaling system. J. Clin. Invest. 117: 1538–1549.
. 2008. IL-33 reduces the development of atherosclerosis. J. Exp. Med. 205: 339–346.
. 2002. Expression and regulation of ST2, an interleukin-1 receptor family member, in cardiomyocytes and myocardial infarction. Circulation 106: 2961–2966. 2000. Atherosclerosis. Nature 407: 233–241.
. 2004. Genetics of atherosclerosis. Annu. Rev. Genomics Hum. Genet. 5: 189–218.
. 2009. Interferon gamma: a master regulator of atherosclerosis. Cytokine Growth Factor Rev. 20: 125–135.
. 2005. A selective role for the TNF p55 receptor in autocrine signaling following IFN-gamma stimulation in experimental autoimmune uveoretinitis. J. Immunol. 175: 6286–6293.
. 2007. Epstein-Barr virus induces a distinct form of DNA-bound STAT1 compared with that found in interferon-stimulated B lymphocytes. J. Gen. Virol. 88: 1876–1886.
. 2007. Chlamydia pneumoniae—induced macrophage foam cell formation is mediated by Toll-like receptor 2. Infect. Immun. 75: 753–759.
. 2000. Corresponding distributions of increased endothelin-B receptor expression and increased endothelin-1 expression in the aorta of apolipoprotein E-deficient mice with advanced atherosclerosis. Pathol. Int. 50: 929–936.
. 1992. Interferon-gamma inhibits scavenger receptor expression and foam cell formation in human monocyte-derived macrophages. J. Clin. Invest. 89: 1322–1330.
. 1998. Oxidized LDL increases and interferon-gamma decreases expression of CD36 in human monocyte-derived macrophages. Arterioscler. Thromb. Vasc. Biol. 18: 1350–1357.
. 1979. Binding site on macrophages that mediates uptake and degradation of acetylated low density lipoprotein, producing massive cholesterol deposition. Proc. Natl. Acad. Sci. USA 76: 333–337.
. 2001. Identification of a gamma-interferon-responsive element in the promoter of the human macrophage scavenger receptor A gene. Arterioscler. Thromb. Vasc. Biol. 21: 825–831.
. 2004. Interferon-gamma impedes reverse cholesterol transport and promotes foam cell transformation in THP-1 human monocytes/macrophages. Med. Sci. Monit. 10: BR420–BR425.
. 2000. Interferon-gamma induces downregulation of Tangier disease gene (ATP-binding-cassette transporter 1) in macrophage-derived foam cells. Arterioscler. Thromb. Vasc. Biol. 20: 1565–1571.
. 2001. TGF-beta increases cholesterol efflux and ABC-1 expression in macrophage-derived foam cells: opposing the effects of IFN-gamma. J. Lipid Res. 42: 856–863.
. 2007. Macrophage scavenger receptors and host-derived ligands. Methods 43: 207–217.
. 2009. Lipid ligand-activated transcription factors regulating lipid storage and release in human macrophages. Biochim. Biophys. Acta 1791: 486–493.
. 1999. 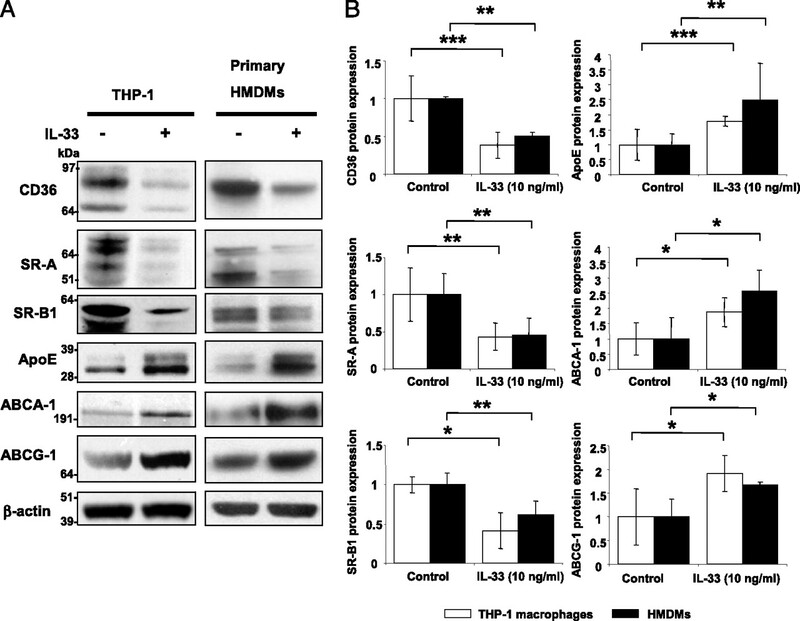 Transcriptional inhibition by interleukin-6 of the class A macrophage scavenger receptor in macrophages derived from human peripheral monocytes and the THP-1 monocytic cell line. Arterioscler. Thromb. Vasc. Biol. 19: 1872–1880.
. 2009. Interleukin-10 facilitates both cholesterol uptake and efflux in macrophages. J. Biol. Chem. 284: 32950–32958.
. 2008. Identification of neutral cholesterol ester hydrolase, a key enzyme removing cholesterol from macrophages. J. Biol. Chem. 283: 33357–33364.
. 2007. Interleukin-10 inhibits the down-regulation of ATP binding cassette transporter A1 by tumour necrosis factor-alpha in THP-1 macrophage-derived foam cells. Cell Biol. Int. 31: 1456–1461.
. 2005. Interleukin-10 enhances the oxidized LDL-induced foam cell formation of macrophages by antiapoptotic mechanisms. J. Lipid Res. 46: 211–219.
. 2000. Regulation of cholesterol distribution in macrophage-derived foam cells by interferon-gamma. J. Lipid Res. 41: 75–83.
. 1995. Regulation of smooth muscle cell scavenger receptor expression in vivo by atherogenic diets and in vitro by cytokines. J. Clin. Invest. 95: 122–133.
. 2004. The chemokine and scavenger receptor CXCL16/SR-PSOX is expressed in human vascular smooth muscle cells and is induced by interferon gamma. Biochem. Biophys. Res. Commun. 325: 1187–1193.
. 1994. Evaluation of the role of Ap1-like proteins in the enhanced apolipoprotein E gene transcription accompanying phorbol ester induced macrophage differentiation. Biochim. Biophys. Acta 1218: 235–241.
. 2000. Complete genomic sequence of the human ABCA1 gene: analysis of the human and mouse ATP-binding cassette A promoter. Proc. Natl. Acad. Sci. USA 97: 7987–7992.
. 2008. P55 tumour necrosis factor receptor in bone marrow-derived cells promotes atherosclerosis development in low-density lipoprotein receptor knock-out mice. Cardiovasc. Res. 80: 309–318.
. 2010. Expression and regulation of interleukin-33 in human monocytes. Immunology.